Dolomite crystals range from transparent to translucent, but dolomite grains in rocks are typically translucent or nearly opaque. The luster ranges from sub vitreous to dull. Dolomite, like calcite, cleaves into six-sided polyhedrons with diamond-shaped faces. 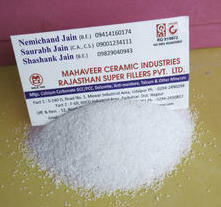 Rajasthan Super Fillers Private Limited, Rajasthan, India becomes an affluent manufacturer, exporter and supplier of Dolomite Grains in Udaipur, Rajasthan, India. We are providing a premium quality range of Dolomite Grains. We graded grains by quality. We reblend the products according to specification, bagged and marked.